There are now lenses and techniques available that can correct vision at near, intermediate, and far distances, called Premium Lenses. 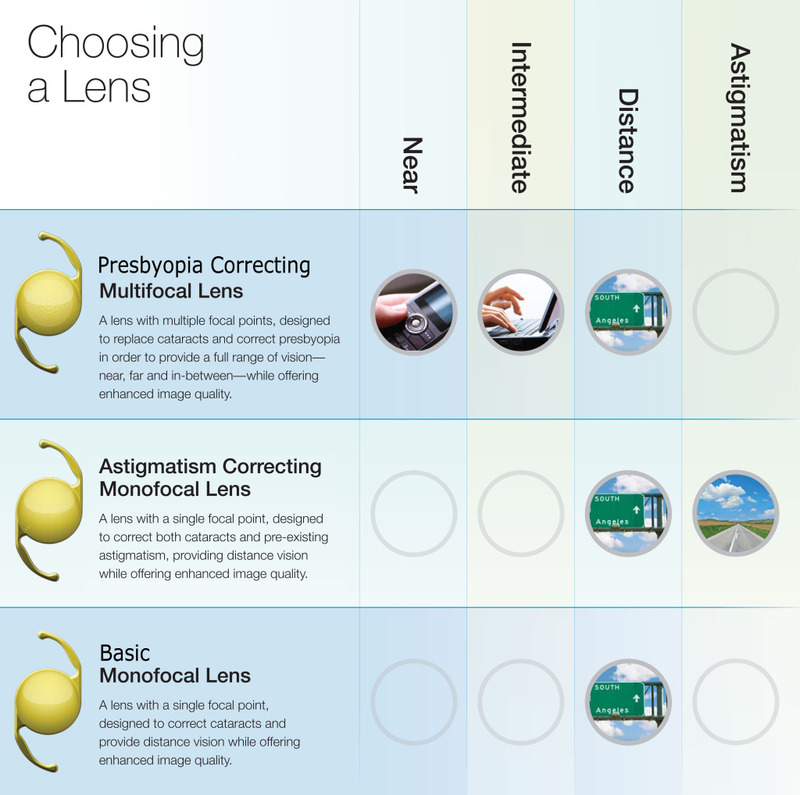 The intraocular lens chosen, and technique used by your surgeon will vary depending on the type of visual outcome you are targeting. Intraocular lenses, or IOLs, are implantable devices that replace the natural lens in the human eye. Technology has improved drastically in recent years, and the possibility for achieving optimal visual outcomes has never been greater. Today, IOLs can treat both cataracts and presbyopia. During your consultation, your doctor will discuss the most appropriate IOL and treatment plan for your eye, and make you aware of the risks, benefits and realistic expectations for your improved eyesight. Monofocal IOLs have one point of focus, either distance or close up. Multifocal IOLs provide two or more points of focus and are designed to reduce the dependence on reading glasses as a result of presbyopia. Toric IOLs are designed to correct astigmatism, potentially reducing the need for glasses.